In the traditional matrix of an original and a copy, proximity to the touch of the maker’s hand is everything. The assumption here is that an original work—imbued directly with the value of its maker’s labor—accumulates value, while a copy of the work is bereft of its singular emanations, though it may serve as a vehicle to distribute its ideas. Or, to leave aside economic terms and look to philosophical ones, at one time it was widely held that originary Form was ideal, transcendent, and celestial, whereas the copy (its terrestrial version) must be limited, even degraded, by its material nature. Presently, we tend to think of this binary in reverse: an immaterial copy derived from existing form—digital pixels or coded information calculated from material instantiation—persists untainted, capable of generating nearly identical physical manifestations. Such dematerialization of information has changed the ease with which certain types of copies can be made; even as Walter Benjamin famously mourned mechanical reproduction’s leaching away of aura, he also recognized the emancipatory potential of such technologies, particularly the “revolutionary use value” that widely distributed images might possess. But the freedom that contemporary reproduction technologies provide has only convoluted our understanding of what the copy might signify, if indeed it signifies anything at all. Nearly a half century after Benjamin first wrote on aura, Jean-François Lyotard curated the now-legendary exhibition “Les Immatériaux” at the Centre Pompidou in 1985, beginning and ending the show with two versions of the same artifact: an ancient Egyptian relief depicting a goddess with the pharaoh. The stone sculpture itself was installed at the exhibition’s entrance, and an image of the work, optically scanned and divided into several overlapping images, was projected in the final room. This presentation of the original sculpture and its disembodied, “electronically dematerialized” duplicate captured the central premise of the exhibition: that the human relationship to matter was shifting with advances in technology, and that these new methods and materials “question the idea of Man as a being who works, who plans and who remembers: the idea of an author,” as Lyotard wrote. Technology, at that moment, was beginning to complicate the poststructuralist notion of the slippery nature of authorship even further. Reproduction by machine happens so easily now: command-C, command-V. It can be hard to remember that it was not digitization but industrialization that first gave rise to easy replication and its attendant philosophical knots, and easy to forget the full scope of the role of copyist, historically encompassing the manuscript scribe, the forger, the counterfeiter, and the appropriationist, among others. Well into the twenty-first century, artists use variations on the copy (as a strategy, process, or maneuver) to bestow ironic distance, nod in homage, or to furnish an indexical mark of reality. If the copy’s history in art begins, most basically, with the mimetic act—the imitation of nature by human hands—the primacy of realism has arguably since been superseded by the conceptual possibilities of the copy itself. The notion of the copy that springs most readily to mind may be that involving technologies of facsimile (optical, physical; by hand, by machine) but the copy also includes the knock-off, the remake, the reenactment, the meme. At stake in each of these practices—and in “Copied” as an exhibition—is an investigation of what is made or unmade through the act of copying, the ratio of signal to noise that results in the passage from original to offspring. 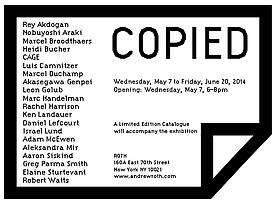 Not all the artists included in “Copied” admit to an interest in the matter of reproduction. Elaine Sturtevant, the grande dame of artistic repetition, who has been remaking works of art by her peers for nearly five decades, abjures any relationship between her work and “the copy” broadly writ; rather, her mode of re-presentation throws into sharper relief the very notion of an original idea, and underscores the modes of transmission and reception of the received canon of art. The catalogue in which this essay appears is itself an altered copy of an artist’s book by Sturtevant from 1973, which presents mimeographed images of Warhol’s Marilyns, Joseph Beuys’s actions, and several works of Duchamp’s, including Wanted: $2,000 Reward, in which Sturtevant has replaced Duchamp’s mug shots with those of her own face. These mimeographs, degraded to the point of near disintegration, seem to both illustrate and enact the endgame of art’s reproductive strategies. Today, the transmission of art occurs not through mimeographs or black-and-white magazine reproductions but via full-color networked images viewed on various electronic devices. Perhaps this explains why harnessing the technologies of reproduction self-reflexively seems to be a particularly crescive artistic practice—that is, taking the copy, not the original, as subject. Like Sturtevant, Israel Lund often reproduces images of other artists’ work; he begins with bootlegged reproductions snapped in galleries with a PDF-making app on an iPhone, and then screen-prints the resulting files. Or, eschewing a specific original work, Lund focuses on the noise of reproduction itself: preparing a blank silk screen without any image at all, Lund passes ink through the empty screen onto a canvas, magnifying the visual distortions inherent in the printing technique and effectively folding the technology back in upon itself, a mise en abyme of replication. While Sturtevant and Lund can be seen as mining a particular vein of appropriation, the godfather of appropriation is represented in “Copied” by a rather more straightforward mode of copying: simple verisimilitude. Marcel Duchamp’s cover for the catalogue for “Exposition Internationale du Surréalisme,” held in Paris in the summer of 1947, features a painted relief of a bare breast gently protruding from the surface, as though emerging through a peep-hole. Duchamp collaborated with Enrico Donati to fabricate the reliefs for each copy in the edition; beginning with ready-made foam “falsies,” the pair meticulously painted the mass-produced forms to fashion a convincingly fleshlike appearance, improving the authenticity of the factory-made multiple. Likewise, one of the most recent works in “Copied,” Greg Parma Smith’s Imagine the bones of the model as a source of light within their flesh, engages in classic hyperrealism, selecting existing graphics and transcribing them flawlessly in paint in a layered amalgamation of conflicting pictorial styles. The artistic attraction to realism need not be highly mimetic, of course; Leon Golub’s paintings of political figures, for example, are copied loosely from specific mediated moments. Although the use of photographic media as source material for paintings is widespread, Golub’s intent was more specific: he did not copy from an existing image solely to gain a convincing likeness, but to transcribe that exact representation in the media, to replicate the chosen instant. Rachel Harrison’s tangled colored-pencil portraits of the pop star Amy Winehouse—presumably derived from tabloid and other mass-media sources—position the singer alongside figures appropriated from historical paintings. Made after Winehouse’s untimely passing at the age of twenty-seven, these works gesture toward the endless propagation of celebrity images, a reproduction that goes unchecked by death, with Winehouse now assuming her eternal place in the company of other muses past. But the artistic relationship to copying can also be playful, even when acting as a sort of homage. Marcel Broodthaers’s remake of Stephane Mallarmé’s pivotal book Un Coup de dés jamais n’abolira le hasard presents the work in full facsimile, with some key changes, as the cover suggests: where Mallarmé’s cover decreed that the reader would find a POÈME within, Broodthaers inserted the word IMAGE. And indeed, Broodthaers made an image from the original verses by redacting Mallarmé’s carefully arranged typography, placing bars of unequal thickness over each word to create pure patterns out of the lineated text. An absurd inversion of use-value also takes place in Adam McEwen’s work Wham-O Super Pro 133 gram, in which a Frisbee, a form designed to soar, is winkingly remade in a rather earthbound material: solid graphite. In yet another material reversal, Ken Landauer’s plywood version of the iconic Isamu Noguchi accent table takes on an arguably more venerable subject than the factory-made Frisbee. Landauer refashions the Noguchi table’s well-known curves by cutting the shapes from a single sheet of plywood with very little wastage, negating the finish fetish of the genuine version but positing an alternate, elegant economy of means through his fabrication method. And, in Aleksandra Mir’s video reenactment of one of humanity’s most memorable moments—the moon landing of 1969—one crucial detail is altered: Mir’s moonwalk is reperformed by women. While these pop-cultural touchstones take on a comical note in their remade forms, certain mutations that happen through less intentional replication can be just as curious. The meme, now ubiquitous in our networked age, has existed for far longer than the Internet: as a cultural or religious ideal, the meme’s mutating forms have traveled generationally via memory and description. Nobuyoshi Araki’s early-1970s portfolio of photocopied Buddhas documents such shifting forms, the expressions, decorations, and faces of the god taking on new attributes in the hands of different artisans’ interpretations of received aesthetic principles. Marc Handelman’s ongoing book project amasses stock photos of man and nature in harmony, culled from corporate reports that employ the highly repetitious images to promote their “green” credentials. The replication of key visual themes is striking: again and again, images of the sun’s rays, a hand holding a seedling, or endless blue skies attempt to counteract the chlorotic reputations of resource-extractive multinational companies. If technologies of reproduction allow these visual memes to mutate and proliferate, what of the technologies of reproduction themselves—everything from computer-controlled die-cutting to techniques of molding and frottage to the simple indexical action of the camera itself? 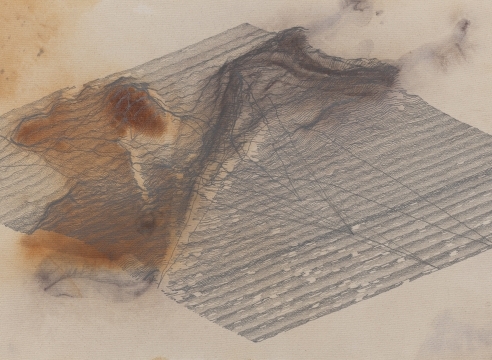 Daniel Lefcourt’s blown-up images of rising dust, splashing liquids, and other minute occurrences taking place on his worktable are reproduced through multiple stages of machine technology, from macro photograph to machine code back to three-dimensional form, creating a substantiated version of an optical event that is sometimes too miniscule or too brief to be observed in its original moment. Rey Akdogan takes the widely distributed supermarket bag of the German discount retailer Aldi—well known for its blue-and-white graphic scheme—and cuts and rearranges its signature plastic stripes, making pencil rubbings from the surfaces of these remixed, three-dimensional collages. Heidi Bucher limned actual space by casting architectural surfaces, making latex skins for rooms, peeling them off, and exhibiting their ghostly traces. Similarly, though Aaron Siskind’s photographs naturally harness the indexical relationship to reality that is the hallmark of medium at large, Siskind’s Chicago 31, 1952 has a more particular relationship to reproduction: Siskind seems to have focused on excising and replicating a particular slice of reality in order to draw attention to the oft-missed view, the overlooked moment. One further mode of reproduction should be mentioned, key to the functioning of contemporary society: the highly evolved technology used to print paper currency, to supply those carefully engineered images steeped in symbolic value. The Fluxus artist Robert Watts’s engraved copies of dollar bills and Akasegawa Genpei’s Greater Japan Zero-Yen Notes (created after the scandal of his counterfeit thousand-yen notes, which he originally made to serve as an exhibition announcement, leading to a trial for currency fraud) both take on this quotidian form of the multiple. By engaging in counterfeiting, that unholy nadir of all copying practices, these artists ignored central-bank dictates in order to draw attention to the arbitrary nature of fiat currency itself—the artificial regulations and proscriptions in place that control for the fact that there is no genuine value, no gold, backing these endlessly reproducible bills. A different sort of counterfeiting is manifest in the gold-plated versions of the utility bills and rent checks required to administer the space CAGE on the Lower East Side. These are not simply glossy, ironic facsimiles: functionality is transposed by materially reinscribing the bill, that classic bit of desk flotsam, into something inherently valuable. Of course, the notion of “inherent” value is difficult to parse in the context of art. Certainly, policing the borders of authenticity has been important in controlling the privileged status of the original works of art deemed valuable, however dubiously. For this purpose, we have long used the artist’s signature to indicate the legitimacy of the original. In 1971, Luis Camnitzer made a work on paper that includes a carbon copy of his own signature, below which reads the sentence CARBON COPY WITHOUT VALUE. But we know better. Every copy can be an original: The intentional act bestows originality to the act of copying, and makes each copy into a primary object.